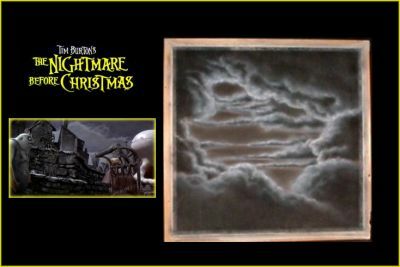 This is a screen used painting of the Halloween Town sky from the Tim Burton animated classic "The Nightmare Before Christmas". This painting can be seen when everyone is heading to Halloween Town's Town Hall for the Meeting Jack requested. This is also the same painting used in many of Tim Burton's promotional photograph's when he is posing with the puppets.